Landlords and investors will be heading to the AJ Bell Stadium on Thursday 21 February to bid on several terraced houses in Manchester, which are among the properties to be sold by SDL Auctions North West. They are among 103 lots which feature in a combined two-venue auction catalogue which is bigger than ever and features lots to be sold in Manchester, at SDL Auctions Cheshire and North Wales’s auction at Chester Racecourse and dozens of lots being sold via online auction. Among the terraced properties going under the hammer at the AJ Bell Stadium are 1 Wareham Street, in a popular part of Crumpsall. With a *guide price of £75,000+, the property has gas central heating and double glazing throughout and comprises a lounge, dining room and kitchen on the ground floor, with two bedrooms and a bathroom upstairs. Outside is a rear yard. Its location just a short walk from North Manchester General Hospital makes the property ideal for the rental market, while Crumpsall Park, shops, schools and amenities are all nearby, and there are regular buses into Manchester city centre. To the east of the city, 22 St. Andrews Avenue, in sought-after Droylsden, is a three-bedroomed mid-terraced property currently achieving a rental income of £8,100 per year. Being sold with a guide price of £100,000+, the property comprises a hall, two reception rooms and modern fitted kitchen on the ground floor, with three bedrooms and a bathroom on the first floor, and additional attic space. It also has gas central heating and uPVC double glazed windows. 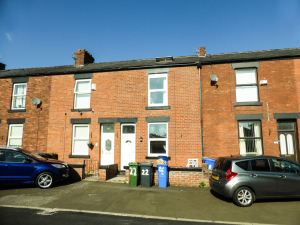 A few streets away in Abbey Hey, 117 Vine Street, a deceptively large three-bedroomed terraced property has a guide price of £80,000+. Currently vacant and requiring some improvements, it could make an ideal family home or a high yielding House in Multiple Occupation, subject to licensing. The accommodation has gas central heating and double glazing throughout and the ground floor comprises a hallway, lounge, reception/dining room and kitchen. Upstairs are three double bedrooms and a bathroom, while outside there is a front and rear yard. These are just a few of the Manchester properties going under the hammer. Further afield, a first-floor studio apartment in Blackpool would make an ideal investment opportunity or first-time purchase, with a guide price of £35,000-£40,000. Flat 16 Boleyn Court, Dalkeith Avenue, has double glazing and Economy 7 heating and comprises a lounge/bedroom, kitchen and bathroom, along with allocated parking. The leasehold property is in a sought-after area of Blackpool, just a few minutes away from Blackpool Victoria Hospital, making it an attractive rental property for NHS staff. Nearby is Blackpool Zoo and Blackpool Park Golf Club, as well as shops, amenities and transport networks. Another property which is just a few minutes’ drive from a hospital is 51 Whetstone Hill Lane, Oldham, a two-bedroomed semi-detached property in an excellent location close to schools and the popular Stoneleigh Park. The property sits on a generous plot with gardens on three sides, has gas central heating and double glazing, and features a lounge and kitchen on the ground floor, with two bedrooms and a bathroom upstairs. With a guide price of £59,000+, it is a great opportunity for landlords to add to their portfolios, or for local families to get on the housing ladder.